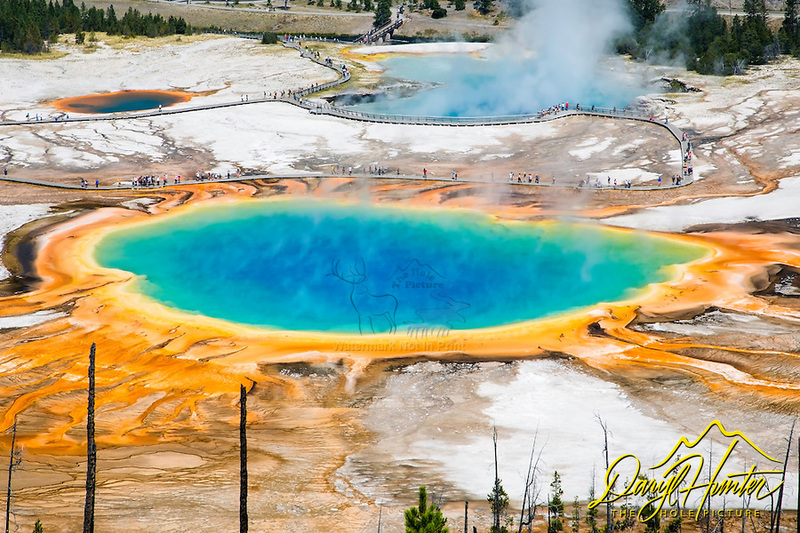 The Grand Prismatic Spring is 370 feet in diameter and the largest of the hot springs in Yellowstone. The center is an intense azure blue. Created by the unique bacteria and algae that live within each hued band of mineral-rich water, the reds, oranges, yellows, greens surround a deep blue core that is too hot to sustain life. The deep blue color of the water in the center of the pool results from the intrinsic blue color of water, itself the result of water’s selective absorption of red wavelengths of visible light. Though this effect is responsible for making all large bodies of water blue, it is particularly intense in Grand Prismatic Spring because of the high purity and depth of the water in the middle of the spring.